Barbara Mahany, a former pediatric oncology nurse, spent nearly three decades as a reporter and writer at the Chicago Tribune. She is now a freelance journalist and author of two collections of essays. Her first, Slowing Time: Seeing the Sacred Outside Your Kitchen Door (Abingdon Press, October 2014), has been called “balm for the hurried heart,” and “a field guide into your holiest hours.” Her latest book, Motherprayer: Lessons in Loving (Abingdon Press, April 2017), explores the sacred mysteries of mothering — its sorrows, joys, trembles, hallelujahs, and the tumble of questions without answers. She walked home along Chicago’s lakefront that afternoon, dialed Northwestern University’s Medill Graduate School of Journalism, and asked if they might have a spot for a nurse. Barely a year after that first “would-you-have-room-for-me?” phone call, she graduated from Medill at the top of her class, and scored an internship at the Chicago Tribune upon graduation. Just a few weeks into the internship, after she landed a Sunday front-page byline with her story about Mother Theresa’s nuns coming to one of the poorest parishes on Chicago’s West Side, the Tribune’s old-school metro editor swaggered across the newsroom and asked her if she was interested in a full-time job. That was the summer of 1982. Ever since, she’s been drawn to deeply human stories, where she has displayed a nurse’s knack for tapping into the hearts of those whose story she is telling. She counts among her life’s treasures the hundreds of letters she’s received from readers who tell her they’ve clipped one of her stories and tucked it in a wallet, a bedroom drawer, or slipped it in a plastic sleeve and carried it wherever they’ve gone. 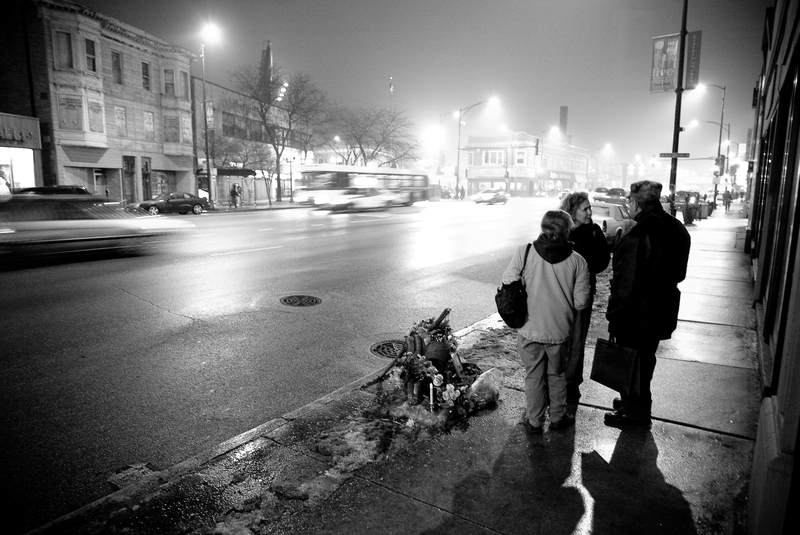 One such fellow, the Pigeon Man of Lincoln Square, who was struck and killed by a hit-and-run driver one cold December’s eve, died clutching a laminated copy of the story she had written about him three years earlier. During her nearly 30 years at the Tribune, Mahany spent the first five years on the city desk, covering breaking news and trolling for trend stories in the city and suburbs. During her news-reporting years, Mahany was dispatched for a few months to Washington, D.C., to work on the Iran-Contra investigations, and when Prince Charles came to Chicago, she recorded in her notebook every dip and twirl as he took to the ballroom with the ladies of the Oak Brook Polo Club. Once her proverbial Little Black Dress was worn to threads, she piled her features plate with plenty: from a front-seat profile of the Truck Driver of the Year, riding cross-country in an 18-wheeler, to a tale of Jell-O wrestlers, or, at the far other end of civility, the quirks of fox hunting. And, in a years-long series of stories, she spent months documenting everyday families as they navigated life’s passages — a young couple’s first birth, the slow death of a father of four, another couple emptying the nest as they sent the last of four kids off to college, or another family up and moving cross country when the dad took a faraway job. During her last assignment at the Tribune, she was, for three years, part of the National Content team writing lifestyle stories — garden, health, family, food, books, travel and home, among the subjects — for eight Tribune newspapers and websites around the country, including the Los Angeles Times, the Baltimore Sun, and the Orlando Sentinel. While at the Tribune, Mahany met and married Blair Kamin, the Tribune’s Pulitzer Prize-winning architecture critic. They have two sons, Will and Teddy, whom they call their double bylines — their best ones, ever. By far. i decided a while back that my own private chapter closing would be the day i climb to the attic and sift through the boxes and crates of old yellowed newspaper clips, to read and remember, to run my fingers over the grainy photos from long ago, to absorb through and through the holy walk that was this chapter. there is much to remember as i flip through the pages of all of the years. one has to be the story i wrote about the farmer who lost her soldier son, and turned to the fields to till through her grief. i sat beside her one hot summer’s day on her creaky old porch swing, down on a farm where the trees scratched the sky. i wrote what she said, what i noticed, what stirred in the air. and once that story hit the paper it somehow wound up in faraway maine. there was a fellow who worked in some shop up there, and when he sat down to lunch one particular day, he found the chicago tribune spread on the table. he picked it up and read the story about the farmer and all of her sorrow. he put the paper back down, and went back to work. but that night, driving the two hours home, he couldn’t stop thinking of the story — and the farmer. so he turned his truck around, and drove back to the shop. he tore through the trash cans till he found it, the newspaper section with the farmer, standing out in her field looking skyward. he rolled up the paper, tucked it under his arm, tossed it onto the passenger seat and drove home. he stared at that paper for awhile, then he got brave. sat down and penned a letter. addressed the envelope with nothing but her name and the name of the town he read in the dateline of that newspaper story. to make a long story short and sweet, here’s what happened: he wrote, and she wrote. back and forth for the better part of a year. even a phone call or two. he invited her to come up to maine. she did. she went back home and put her farm up for sale. they farm together in the north woods of maine now. all because he read her newspaper story. another favorite is the one about the pigeon man of lincoln square, a curious fellow, a fellow who struck me right away, a fellow whose story i had to find out. he used to sit on a fire hydrant along a busy city street, and dozens of pigeons flocked to him, perched on him. i nearly swerved out of my lane the first time i saw him. i drove back quick as i could, talked to him off and on over the course of a few days. went up to his attic apartment, the place where he kept his pigeon-feeding supplies and rested his head. i wrote his story. wrote how he struck me as some sort of st. francis of the city. three years later, that old man with the crooked spine was shuffling along another busy street when a van up and hit him. he fell right there on the sidewalk, died before they got to the ER. as they lifted his body onto a stretcher, the police told me he was clutching a laminated copy of the story i’d written three years earlier. those might be the bookends of my shelf of favorites — a start and an end. but in between, there would be so very many. the trek across america, all on my own, back in 1984, as i traveled to see and to hear — from the rio grande valley to the mississippi delta, from pennsylvania steel mills to backwoods in maine, from salmon fisheries in northern california to farm towns in iowa — just what it meant to be hungry in america. or the night when i stood, nose pressed against the crack between ballroom doors, and watched prince charles swirl on the dance floor with all of the ladies of the oak brook polo club. or the mother, long long ago, who had a sweet boy with down’s syndrome whose smile i will never forget. or the father whose daughter lay dying of anorexia nervosa. or the little boy who fell through the ice of lake michigan but did not die, and so i kept vigil with his mama and papa as the whole city watched and waited and held their collective breath. after all those 30 years, when i think back over the breadth and depth of humanity i have scribbled into my notebooks, soaked into my heart, i sigh a mighty sigh and whisper one solitary truth: it really was the voyage of a lifetime.